The webapp requires a single CSV with columns for a binary score, a binary label_value and an arbitrary number of attribute columns. Each row is associated with a single observation. Aequitas webapp assumes the score column is a binary decision (0 or 1). This is the ground truth value of a binary decision. The data again must be binary 0 or 1. 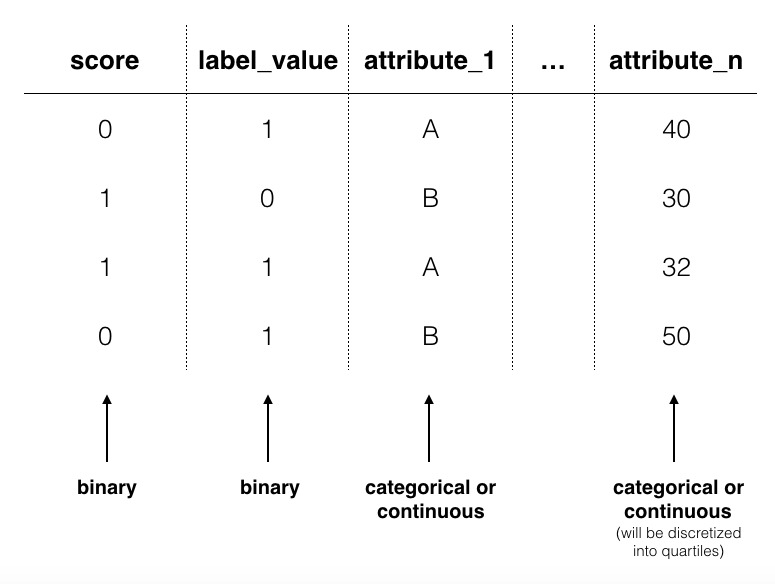 Group columns can be categorical or continuous. 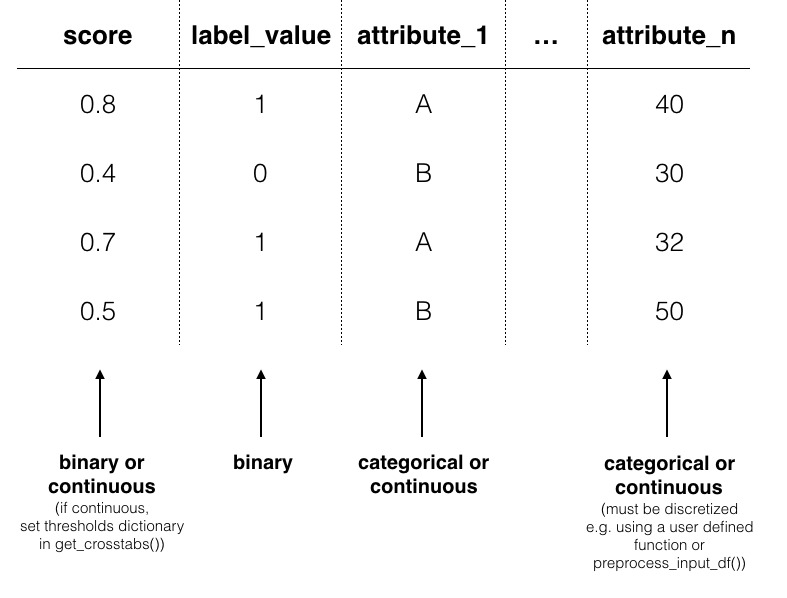 If categorical, Aequitas will produce crosstabs with bias metrics for each group_level. If continuous, Aequitas will first bin the data into quartiles and then create crosstabs with the newly defined categories. The CLI accepts csv files and also accomodates database calls defined in Configuration files. By default, Aequitas CLI assumes the score column is a binary decision (0 or 1). Alternatively, the score column can contain the score (e.g. the output from a logistic regression applied to the data). In this case, the user sets a threshold to determine the binary decision. See configurations for more on thresholds. As with the webapp, this is the ground truth value of a binary decision. The data must be binary 0 or 1. Group columns can be categorical or continuous. 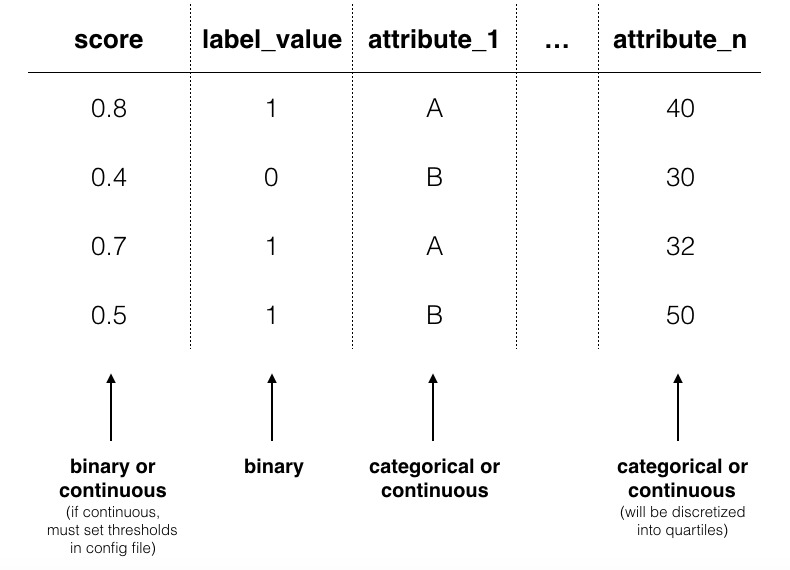 If categorical, Aequitas will produce crosstabs with bias metrics for each group_level. If continuous, Aequitas will first bin the data into quartiles. model_id is an identifier tied to the output of a specific model. With a model_id column you can test the bias of multiple models at once. This feature is available using the CLI or the Python package. Python input data can be handled identically to CLI by using preprocess_input_df(). Otherwise, you must discretize continuous attribute columns prior to passing the data to Group().get_crosstabs(). # *input_data* matches CLI input data norms. See CLI. Threshholds are set in a dictionary passed to get_crosstabs().